A huge hit with the office-going crowd, Sai Sandwiches operates out of a rickety stand on MG Road and makes one of the best Bombay Sandwiches in the city. Gobble one up for just INR 30. For those of you who frequent MG Road, you would have spotted Sai Sandwiches at one time or the other. Located on the footpath at the beginning of Brunton Road, the tiny stand is popular with office-goers in the area. It’s been a regular fixture for years now and does brisk business doling out humble Bombay Sandwiches that have a generous filling of cheese. If you are in the vicinity and want a quick bite that costs you next to nothing, head straight to the stand. At the side of the circular tin cover that shields the hot stove, the handful of offerings are listed. There’s Aloo Cheese, Tomato And Cheese, Bread and Butter and Jam and Butter to name a few. While not fancy, the sandwiches are filling. 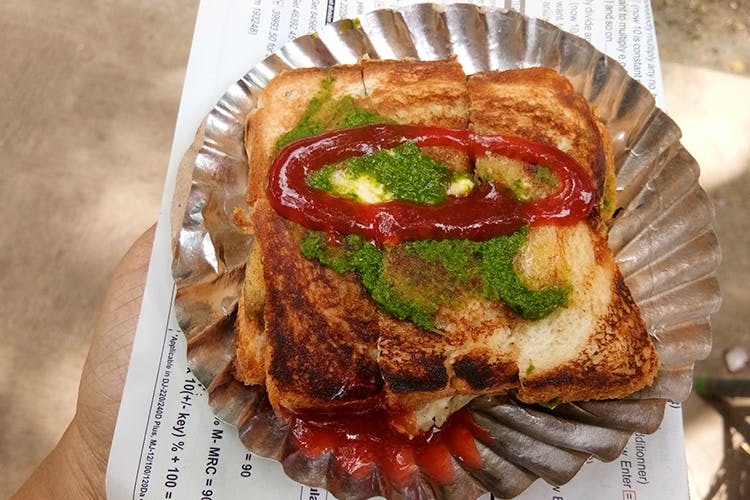 For just about 30 bucks, you can get two slices of fresh bread slathered with a chilli chutney, topped with generous shavings of cheese (Amul, of course), and the filling of your choice. The sandwich is then toasted in front of you and served up with a squirt of ketchup. It tastes a lot like something that would come out of your kitchen at home and is definitely worth every penny you pay. Don't do a takeaway from this stall; it just doesn't taste the same.